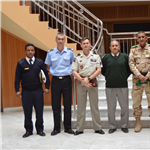 On 11th December 2014 a delegation from Headquarters Allied Joint Force Command Naples’ Military Partnerships Branch visited the Mauritanian Armed Forces General Staff in Nouakchott, capital of the Islamic Republic of Mauritania, in order to take part in a Military Cooperation Expert Staff Meeting. 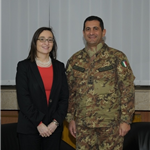 PRISTINA, Kosovo, on the 16th December 2014, COMKFOR Major General Francesco Paolo Figliuolo had a meeting with H.E. Ambassador Dimitris A. Moschopoulos, Advisor to Kosovo Institutions on Religious and Cultural Heritage. 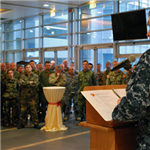 Members of Allied Joint Force Command Naples observed the anniversaries of Partnership for Peace (PfP), the Mediterranean Dialogue (MD) and the Istanbul Cooperation Initiative (ICI), December 15, 2014. 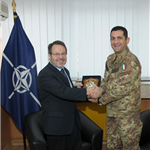 PRISTINA, Kosovo, on the 12th December 2014, KFOR Commander, Major General Francesco Paolo Figliuolo, met with the Minister of Defence of Slovenia Janko Veber, the Chief of the General Staff of Slovenian Armed Forces, General Andrej Osterman, and a delegation of two Slovenian Members of Parliament at the NATO KFOR Headquarters. Commodore Aage Buur Jensen and key members of his staff visited NATO Allied Maritime Command (MARCOM) on Friday, 12 December, 2014, to formally hand over command of Standing Maritime Group 1 (SNMG1) and NATO’s counter-piracy Operation OCEAN SHIELD Task Force 508 (TF-508). 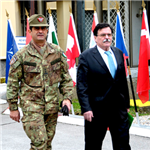 Brigadier General Richter, JFCNP ACOS J9 called the second Balkan Liaison Working Group (BLWG) meeting at Camp Butmir, Sarajevo to bring together the three Senior Military Representatives from Mission Headquarters in the Balkans. 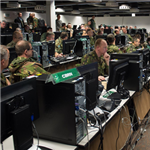 IZMIR, Turkey - NATO’s Allied Land Command has achieved Full Operating Capability (FOC). Lt. Gen. John W. Nicholson, Jr., LANDCOM Commander made the announcement at a press conference during exercise Trident Lance 2014. NIš, Serbia, on the 11st December 2014, KFOR Commander, Major General Francesco Paolo Figliuolo, attended a day of high level talks with the Chief of the General Staff of the Serbian Armed Forces (SAF), General Ljubisa Dikovic. 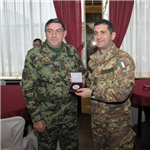 PRISTINA, Kosovo, on the 10th December 2014, KFOR Commander, Major General Francesco Paolo Figliuolo, had a meeting with H.E. Anick Van Calster, the Ambassador of the Kingdom of Belgium in Sofia, at the NATO KFOR Headquarters. PRISTINA, Kosovo – on the 9th December, KFOR Commander, Major General Francesco Paolo Figliuolo, met with the Ambassador of Turkey to Kosovo, H.E. Songul Ozan, at the NATO KFOR Headquarters. 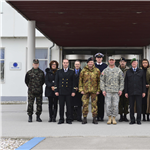 BELGRADE - Serbia- on 5th December 2014, a delegation of Headquarters Allied Joint Force Command Naples` Military Partnership Branch visited the Ministry of Defence of Serbia in the framework of the annual Military Cooperation Expert Staff Meeting. PRISTINA, Kosovo - Kosovo Force Commander, Major General Francesco Paolo Figliuolo, met with the Ambassador of Croatia to Kosovo, H.E. Zoran Vodopija, at the NATO KFOR Headquarters, December 5, 2014.